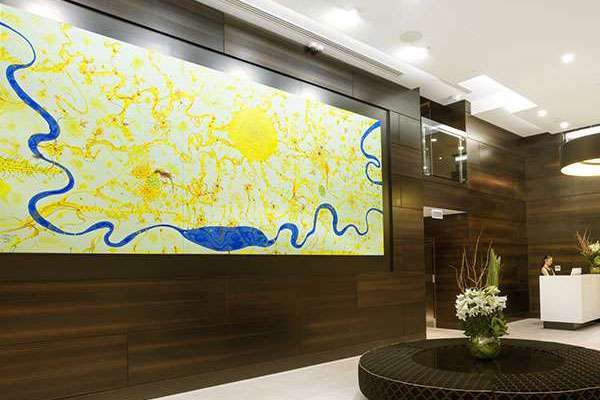 This sunny optimistic painting celebrates the surrounding natural environment. 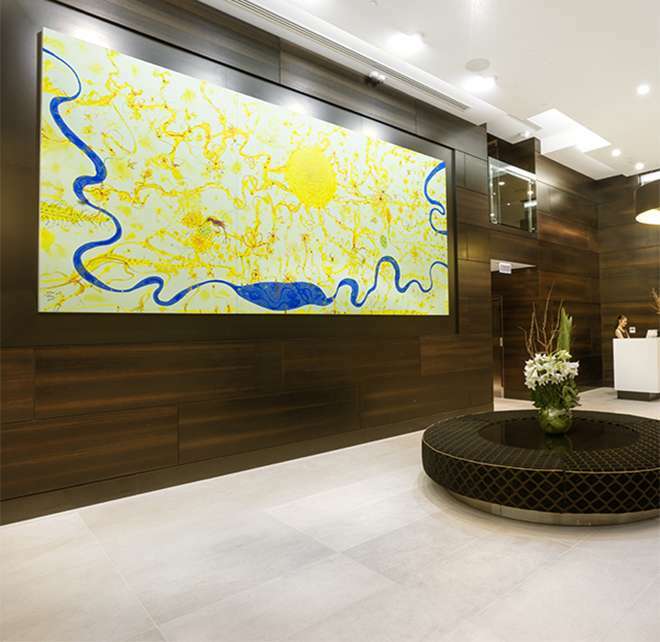 The artist depicts the Yarra River as a natural vein that runs through the city. For the artist, it is a source of fascination that such a lively ecosystem can co-exist with a large bustling city. We see in the work a joyous proliferation of plant, insect and bird life. 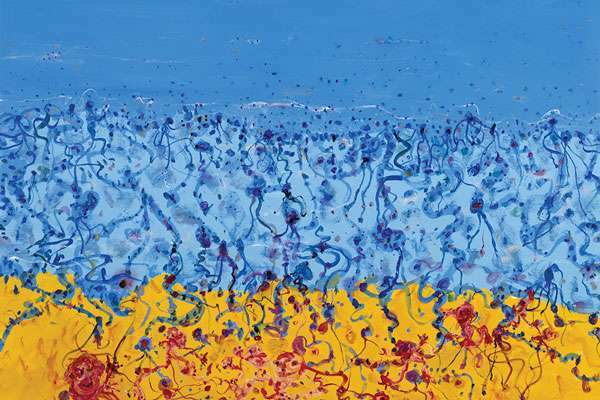 The long tentacles that extend from the sun are a reminiscent of the sun in Olsen’s well-known Sydney Sun painting from 1965, now held in the National Gallery of Australia. 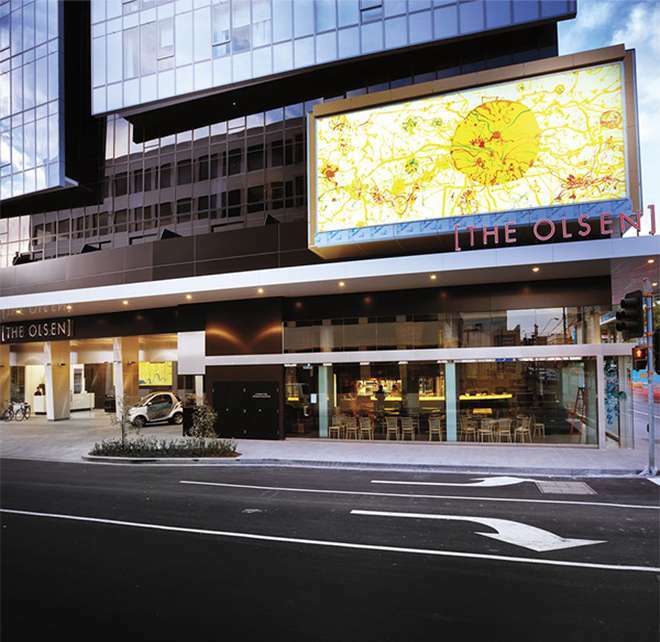 This painting was commissioned for The Olsen hotel by the Deague family. 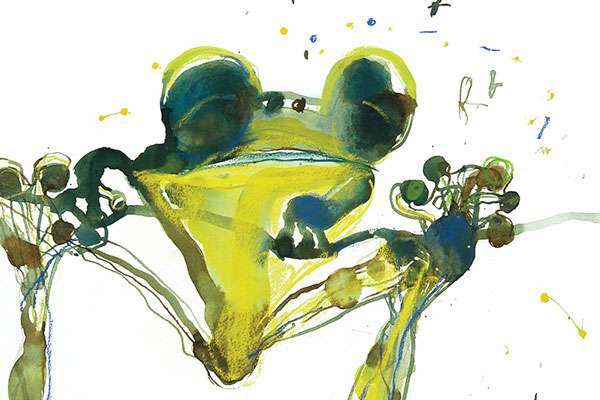 The frog is a key motif in Olsen’s output. The artist is attracted to the theatre of the frog; their flamboyancy; the way they swim; their big bulbous eyes and their elongated back legs. He describes his interest in their astounding ability to articulate limbs in a strange way. For Olsen this work evokes memories of the time he spent as a child at Bondi beach. The colours present a departure from the ochres and terracottas of many of his well-known paintings. The long stringy bluebottles are painted in such a way that they merge with the waves of the ocean beyond. 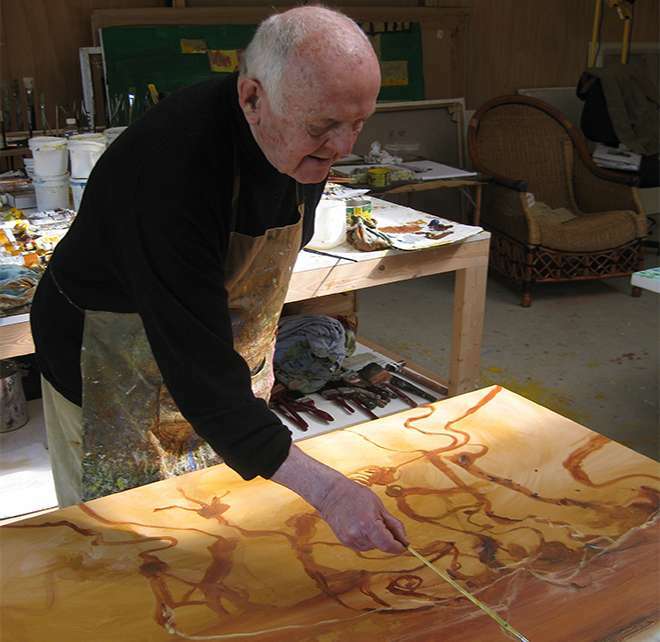 John Olsen was born in Newcastle, New South Wales, in 1928. He studied briefly at the Desiderius Orban Art School and also attended night classes at Julian Ashton’s school of art, studying under John Passmore. He is recognised as one of Australia’s most significant and accomplished artists. From 1956-1960 Olsen lived abroad and journeyed from England to Paris and then to Portugal, Spain and the Island of Majorca. Later travels included Egypt, Kenya, South Africa and America. In 1970 he was commissioned by the Sir William Dobell Art Foundation to paint a large mural for the Sydney Opera House. This major work, inspired by Kenneth Slessor’s poem, ‘Salute to five Bells’ was completed in 1973. Olsen has also travelled extensively throughout Australia introducing a spiritual and mystical insight into the landscapes he paints and the life that inhabits them. After his early abstract works of the late 1950’s and early 1960’s his work became increasingly figurative and recognisable forms developed as his brush danced and walked rapidly across the canvas. He has given us a new interpretation of the Australian scene, redefining the Australian landscape by shifting the viewpoint from ground level to aerial perspective thus creating the horizon-less landscape. The viewer could now observe the meandering rivers and billabongs and experience the landscape as a geographical painted map. Olsen has painted the subtle tones of the deserts in the Kimberley region of Western Australia, the precarious balance of life and death surrounding Central Australia’s Lake Eyre, and South Australia’s Coorong National Park where he explored the complex inhabitants of the wetlands and the microscopic ecological drama beneath the water line. Olsen’s deep commitment and sensitivity to the natural environment is evident in all of his landscapes. His portraits of Passmore, Rees, Bonnard, Rothko, Degas, Renoir and other admired artists of the past, Mediterranean culture, the food, the sun and his passion for Oriental philosophy and calligraphy have provided the inspiration essential to his oeuvre. His creative output has been enormous and he has worked in a variety of media including tapestry, ceramics, oils, watercolours and gouache and has created a body of work which has assured his place in the history of Australian art. He has also produced some of the most collectable portfolios of prints ever published in this country. Lake Eyre and the Desert Sea, Edge of the Void, Earth Hold, Spring in the Valley, Down Under, Summer at Owls wood, New York Nowhere and Seaport of Desire. From his early print-making days at Stanley Hayter’s in Paris to the present day Olsen has collaborated with many of the finest master print-makers, and his contribution to Australian Print-making is unequalled. His work is represented in the National Gallery of Australia, all State Galleries, numerous regional galleries and many private and corporate collections. He has won the Wynne Prize in 1969 and 1985, the Sulman Prize in1989, the Archibald Prize 2005 and been awarded an Order of the British Empire (OBE) in 1977 and an Order of Australia (AO) in 2001 for services to the arts.